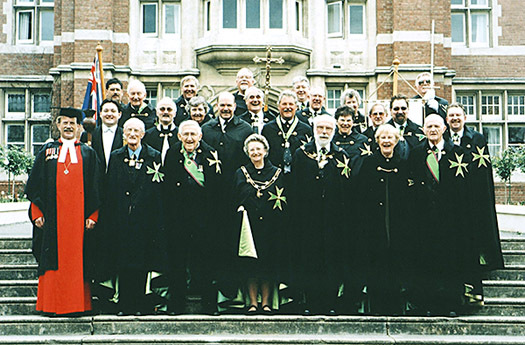 Some years ago, after the establishment of the Otago Commandery, the Southern and the Otago Commanderies agreed that, rather than have separate ceremonies, the two Commanderies would combine for a single annual Virgil and Investiture, and that, in the meantime, in a three year cycle, two ceremonies would be held in Christchurch with one in Dunedin. To make it more convenient for those who would have to travel to attend a particular ceremony, it was also agreed that these ceremonies would be held at the same time each year, which was settled upon as the first weekend in October. 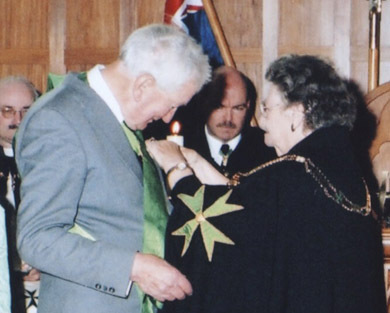 Approval for these arrangements was sought and granted and the 2001 and 2002 ceremonies were held in Chirstchurch, with members from Dunedin travelling north for the event. In 2003 it was the turn of the Southern Commandery to travel, and a respectably-sized contigent set off on a journey which was to take members below the 45th parallel, and which, as later events were to demonstrate, could very well have led to a longer stay in Dunedin than anticipated. This rewarding and pleasurable event was to take place before some of the out-of-town members were to experience anything that might be considered as unpleasant. The hard-working members of the Otago Commandery, had chosen a most suitable site for the Vigil and Investiture. These were located on the north end of Dunedin. Members were sent the first newsletter listing the hotels and motels in the area. One of these hotels was the same hotel to be used for our Investiture. This hotel was most traveller's first choice. This gave members an ideal opportunity to have discussions and meet with other members of the Order on topics of mutual concern. Three members stayed, in this hotel, from the North Island. The first scheduled event was the Vigil, which was held in the Dunedin Hospital Chapel. This location proved a most suitable venue for the service, which was led by the Otago Commandery Chaplain, The Rev. David Crooke. The form of service decreed by the Grand Master was to be used in all jurisdictions for both the Vigil and the Investiture. Both were easily and satisfactorily adapted to form a meaningful form of the service for occasions where there are no postulates. The Vigil was most suitable for the addition of the membership of the Itago Commandery. All of those present must have been pleased to be able to support Evan (Lox) Kellas as he took the first formal steps to his admission to the Order. If the fact that most of the out-of-town visitors chose to stay at the one hotel contributed to the success of the weekend, the inclusion in the programme of the Chapter meeting was a contributing factor. The meeting was held in the Frank Nichol Room at Knox College and was chaired by the Chancellor, who said afterwards how delighted he was at the attendence and at the contribution that members had made to the debate on various issues. Not the least was the response to his request that members conider how the Chapter meeting can be provided for the new constitution, given the geographic distribuion of the various Commanderies. Following the Chapter meeting everybody took part in a rehearsal in the Know College Chepel for the Investiture. While not everyone considers that rehearsals are essential, there is no doubt that if they are not held, that there might be mistakes made or a propgram will not go smoothly. The Marshal is there to tell attendees what will happen, not to arbitrate between various options. 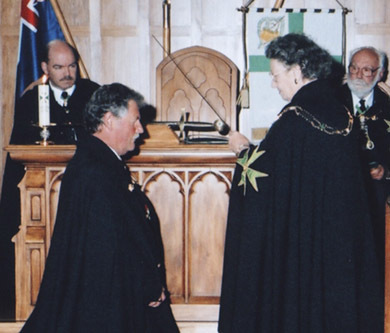 In Dunedin, we had a Marshal who led is through the various stages of the Investiture in such a way that no one could have been in doubt as to what was about to happen and who was to take on what duty during the ceremony. The proof of the success of the rehearsal was the event itself. Everyone was in the right place at the right time. The afternoon ceremony began with the processional in the Frank Nichols Room, then we crossed the quadrangle to the Chapel. The processional then retraced that route back for disrobing and afternoon tea. The Grand Prior is ready to dub Confrere Jesperson as Knight. The formal events of the weekend concluded with a dinner, which was appropriate for a function of this kind, which was held in the "Edinburgh of the South." The fare included haggis, which was piped in with the appropriate ceremony, and addressed in the traditional style. This happened before the haggis was tested by haggis gourmets and passed over by a few who did not appreciate its traditions or taste. Administrative difficulties in the Grand Secretariat some years ago had resulted in the production of brevets being held up and there had been a long and involved exercise in preparing the missing brevets for distribution. The dinner provided a great opportunity for the Grand Prior to present their brevets to those members of the Otago Commandery who were present. The Grand Prior also presented Certificates of Commendation to Dame Pykle for her valuable work over many years for the Order. To round off what had been a most enjoyable function, the Kowhai Herald of Arms, CHevalier Jim McCready, presentede Chevalier Jesperson with a copy of his Arms as recorded in the Green Book. On Saturday morning, Dunedin had been greeted with a perfect late spring morning. We had clear blue skies and little wind. As the day progressed, there were indications that a weather change was coming, but most thought the day was beautiful. Sunday brought us snow. The hotel was a few metres above sea level, and many thought of the drive back to CHristchurch with some concern. The Christchurch drive entailed some reasonably-sized hills that would need to be negotiated on the trip back to the North. These concerns bore fruits as the motorway was closed for a time. However, this was a first-class weekend in spite of mother nature's surprise. The Otago had put forth meticulous plans to make the event a success. Otago's hospitality is part of their province's traditions. As an added bonus, we visited the "Chinese Dinosaurs" in the Otago Museum, to give people a break from the concerns regaring the closure of the highway. This meant that those from Christchurch would not have to make a special trip back to the museum. 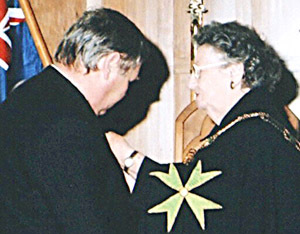 If, at any stage, it is decided that the Grand Priory revert to a single annual Investiture, the ceremonies must form a part of the overall programme which will provide something for eveyone. 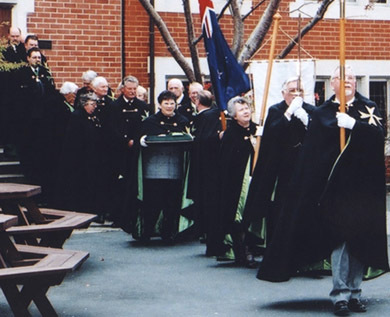 What the Otago Commandery put together in 2003 could well be a model for future years. The Procession moving off to the Kent College Chapel. If the Hospital Chapel had been an ideal venue for the Vigil, the Knox College Chapel was an inspired choice - just the right size for the members of the Order and their guests, with perfect acoustics, and their collegiate layout was so appropriate for a gathering of members of an Order of Chivalry. We were given a very warm welcome, to the Chapel, by the Master of Knox College, Mr. Bruce Aitkens, who was accompanied by the Knox College Beadle, Mr. Geoffrey Kohe. Lizzie Tyrell sang the anthem of the Order to the Bach-Gounod tune. The organist was Mr. Kemp English. Members of the St. Kilda Sentinel Brass Band played the fanfares. The Rev. David Crooke took the service and the Southern Commander, Chevalier Alan Polaschek and the Chancellor gave the readings. During the ceremony, Chevalier Connor, the Otago Commander, gave an address outlining the history of the Order and its missions. Although this address was designed for our visitors, it contained material of great interest to our present members as well. After Lox Kellas's admission as an Officer, the Grand Prior presented Chevalier Ernie Pyle with his cordon on his promotion to KCLJ, and promoted Confrere Rex Jesperson to Knight of Grace. Following the ceremony, photographs were taken on the college steps. One of these photographs follows. We then retired to the Frank Nichol Room with afternoon tea for our guests, thus bringing an end to what was a most successful function. Middle Row: Geoffrey Kohe (Know College Beadle); Chevalier Pyle; The Rev. David Crooke; Dame Pyle; Chevaliers: Wills, Polaschek, Jesperson; Confrere Mellish, Dame Mellish, Consoeur Connor, Confrere Rae, Chevaliers Biel and Connor. Front row: Mr. Bruce Edgar (Master, Know College); Chevaliers Weston and Roberts; the Grand Prior, the Chancellor, Dame McCready and Chevalier McCready.